A measles outbreak in the U.S. has cast a spotlight the anti-vaccine movement. More than 275 people have been infected since October, about half of the reported cases in 11 states nationwide. 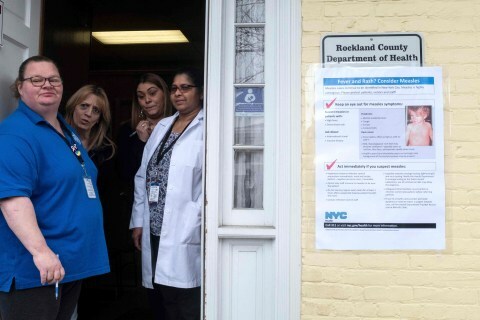 More than 100 people in Brooklyn have been infected since the measles outbreak began in October. Over 800 students have been asked to stay home for three weeks due to the ongoing measles outbreak, disrupting their education, health officals say. “For my mother, her love and affection and care as a parent was used to push an agenda to create a false distress,” Ethan Lindenberger told a Senate committee. In 2017, Kim Nelson started a vaccine advocacy group in Greenville, South Carolina, to help reach vaccine-hesitant families. Infants from 9 to 11 months are most at risk, the WHO says. 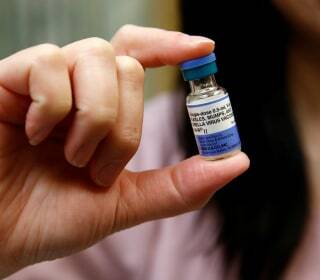 Some unvaccinated teens are using social media to seek advice on ways to get their shots. State health officials are urging vaccinations and discouraging the use of vitamin A, which will not cure or prevent measles. Measles has been declared a public health emergency in one Portland-area county. Here’s another reason to get vaccinated against measles – the measles virus makes kids vulnerable to other infections for years. Nearly 9 million U.S. children are not fully vaccinated against measles and risk getting infected, researchers say in a new report. California lawmakers voted on Thursday to substantially limit vaccine exemptions for school children. Vaccine laws in other states may be toughened, observers agree, if California strips parents' rights to exempt their kids from immunizations. California health authorities declared an end to a measles outbreak that started at Disneyland and triggered a national debate about vaccinations. A measles outbreak that began at Disneyland in December is waning. Oklahoma has its first confirmed measles case since 1997, state health officials reported Friday. Most doctors agree to parents' demands to space out their kids' vaccines a new survey finds. More than 22,000 cases of measles have been reported in parts of Europe and Russia over the past year and the worst-affected countries need to get busy vaccinating, WHO says. At least 141 people have been diagnosed with measles so far this year, 113 of them directly linked to an outbreak that started at Disneyland. The measles outbreak that started Disneyland last month has now affected at least 130 people in 17 states but has yet to take hold in Mississippi. Recent rumors of "measles parties" in northern California are unfounded, according to health officials, who say there's no proof such events occurred. False rumors that frighten parents are clearly behind the current outbreak of measles linked to Disneyland, doctors said at a Senate hearing Tuesday. Delaying vaccines is not only a waste of time, it could be dangerous to your kids. And no, foreigners aren’t bringing most measles cases into the U.S. Eight people, including six infants, have now been infected with measles in a suburb of Chicago mostly linked to a daycare center. Baltimore-area doctors made a public stand in favor of vaccines, urging holdouts to get their kids vaccinated against measles. What's in a Measles Vaccine? Measles vaccines are made using a "live" virus. Measles fever may have reached a pitch in America, but European health officials say they’re looking at the United States with envy. Five babies under the age of 1 have been infected with measles in a cluster at a suburban Chicago daycare center, officials said Thursday. California lawmakers have proposed making it harder for parents to opt out of vaccinating their children. The Centers for Disease Control and Prevention is worried about how far a measles outbreak linked to Disneyland might spread. “Do we need to get into any detail about that?" he added, alluding to rivals' missteps on the issue. Lawmakers who called a hearing on Tuesday to ask what to do about this year’s disappointing flu vaccine got distracted by another virus: measles. It may be the happiest place on Earth, but California health officials are warning people to stay away from Disneyland unless they’re vaccinated. How effective is the measles vaccine? The answer to that, plus more critical answers to your measles questions. If what Uriah Krueger had was a mild case, his parents don't want to even know what a bad case of measles looks like. Under 90 percent of preschoolers have been vaccinated against measles, mumps and rubella in 17 U.S. states, and they’re at risk of becoming infected. It seems like everyone's piling on to attack the anti-vaxxers blamed for the Disneyland measles outbreak. But it's counterproductive, experts say. An outbreak of measles that started in California’s Disneyland probably came from overseas, officials say. Demand for measles vaccines has overwhelmed pediatricians in California – even Dr. Jay Gordon, the doctor best known for treating anti-vaccine activist Jenny McCarthy’s son. Fiona Stone wants you to vaccinate your kids against measles.